Organising a storage unit can be a little like a game of Tetris, trying to make items fit in spaces and use up as much space as you can. Organising your storage unit correctly will protect your possessions from damage, and maximise space. When storing your possessions you will need to think about everything that could go wrong when storing, especially if you are planning on leaving them in your storage unit for a long period of time. Putting wooden pallets on the ground will help protect your possessions from flooding. If you are positive that your storage unit will not flood then you can just put a plastic sheet on the ground to protect anything from dirt. 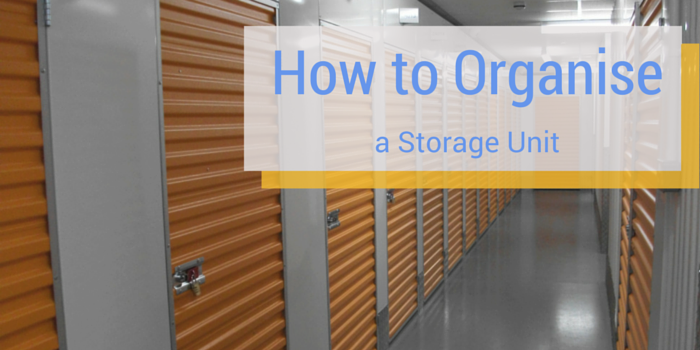 Leaving a small gap in-between items will help air circulate around your storage unit. Covering your furniture or boxes with a plastic sheet will protect them from any damage. Boxes are a great tool when it comes to organising and storing small items in your storage unit. Using plastic boxes that are the same size will mean that you are able to stack the boxes safely, and save space in your storage unit. Remember to wrap fragile items up in bubble-wrap and seal boxes with packing tape to keep everything inside safe. Using sealed plastic bags are never a good idea when storing items. Sealed plastic bags produce humidity and cause a build up of mould inside the bag. When considering where is the best place in your storage unit for your boxes, keeping frequently needed boxes at the front will save time when you are looking for specific items. Labelling your boxes with specifically what is in them, is another way to save time when it comes to finding personal items. Stacking boxes can be dangerous, therefore it is important that you put the heaviest and tallest boxes at the bottom and work your way up to the lightest and smallest. Leaving a walkway in your storage unit is vital. This will make getting to certain items a lot easier as you won’t have to move everything out of the way. If you are storing valuables then the best place for them is hidden at the back of your unit, this means that if your storage unit was broken into the first thing thieves would see won’t be your valuables. Keeping items that you are most likely to use at the front means they will be easier to access. Keeping an inventory of all the items in your unit is important for insurance purposes. When creating an inventory take note of what the item is and how much it is worth, this will make things easier for the insurance company and yourself too. There are many different sized storage units, but no matter what size they are you will always want to save as much space as possible. Filling hollow items, such as drawers and cupboards, can save more space. If you’re storing mainly furniture, if possible, dismantling them is another great way to save space, and make the most of your storage unit.